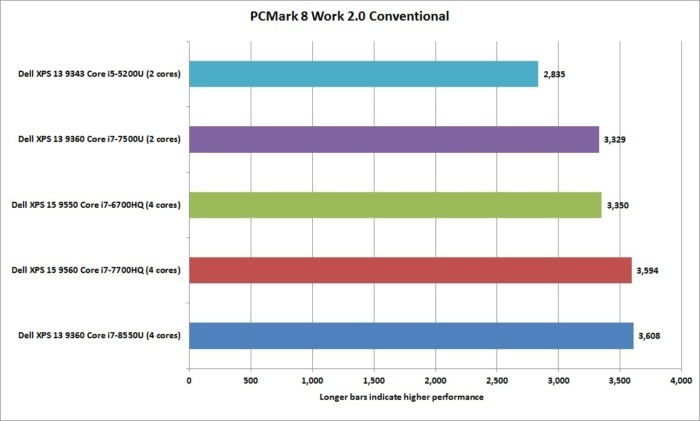 Quad-core performance in a tiny laptop is a big deal. Forgive us if you've heard this one before but Dell's latest XPS 13 is truly the best one yet. Seriously. Newly upgraded with Intel's 8th-generation CPUs, the XPS 13 offers unheard-of performance in an ultra-portable laptop. By "unheard-of," we mean the XPS 13 offers performance approaching and occasionally surpassing that of much larger and much heavier powerhouse laptops. Granted, it hasn't changed much on the outside. As we go through the features and specs, though, you'll see the significant changes happening on the inside. The XPS 13 hasn't changed much on the outside, but this 8th generation upgrade is worth it for performance fiends. Prices: Our review unit currently sells for $1,300 from Dell's website, though at the time of this posting Black Friday deals are offering some nice savings. 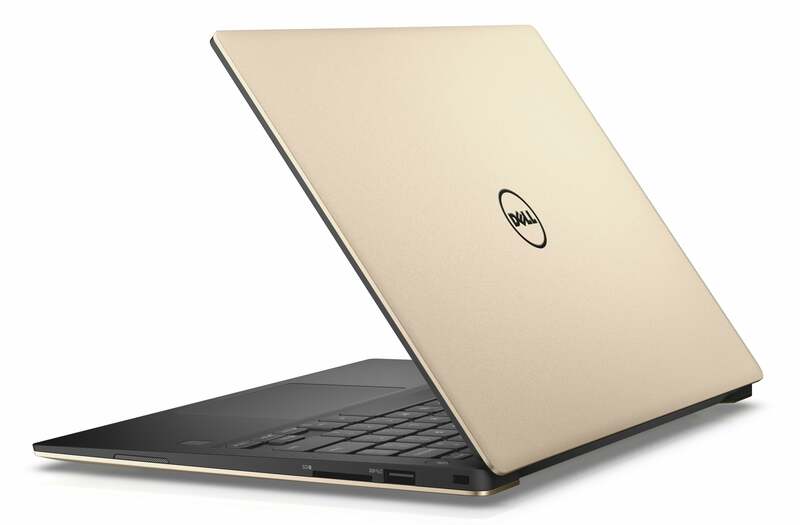 Other SKUs from Dell's site range from the lowest-end $800 version, with a 7th-generation Core i3-7100UCPU, 4GB of RAM, and a 128GB SSD; and the top-of-the-line $1,750 model withthe same 8th-generation Core i7-8550U and 256GB SSD.as our unite, but its memory is boosted to 16GB. RAM: 8GB of LPDDR3/1866. The low-power version of DDR3 doesn't allow for the use of expansion slots, so the RAM is soldered to the motherboard. The good news is Dell used a pair of modules to enjoy the greater bandwidth of dual-channel mode, rather than use a single module that would give you only half the bandwidth. GPU: There's room for a quad-core chip but not for discrete graphics, so what you get is Intel UHD 620. You might think the "U" means something special, but from a performance point there really ain't none. Display: You pretty much get the same 1920x1080 matte screen with "Infinity" bezel on the XPS 13 that we've seen since the first model was introduced in 2015. The one in our unit puts out very decent 400 nits (much like the prior version). While it doesn't have the pizzazz of a "glossy" screen (which Dell offers in the touch-screen version) it does a great job of reducing glare. Storage: A 256GB Toshiba M.2 NVMe SSD handles the storage, and if you're willing to risk opening up the XPS 13, you should be able to swap in a larger drive. 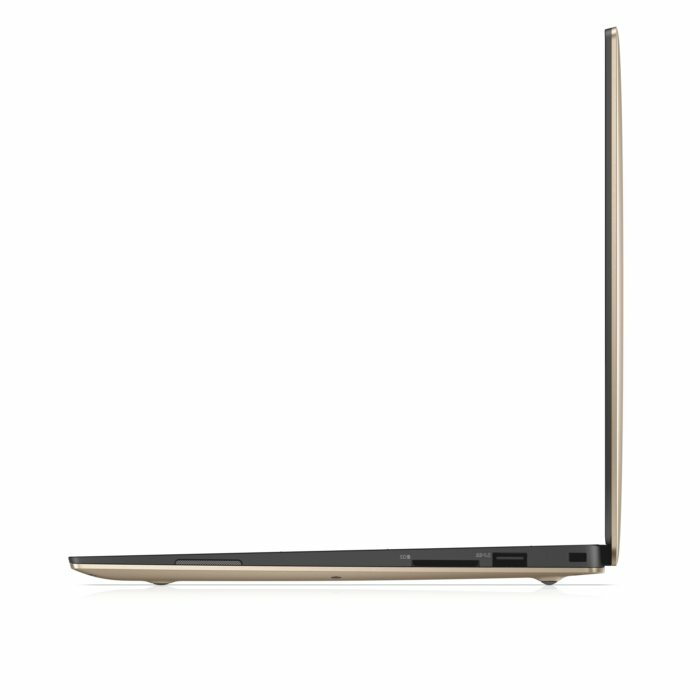 The right side of the Dell XPS 13 sports the SD card reader, one of its two USB-A ports, and the Noble lock port. Ports: For connectivity, you get two USB 3.0 (5Gbps) Type A ports, an SD card reader, combo audio and a single Thunderbolt 3 port. That Thunderbolt 3 port is a two-lane implementation rather than four-lane, so maximum throughput is less than what you'd get with some competing laptops. There's also a square lock port supporting Noble locking cables. The XPS 13 supports (and ships with) a standard barrel charger, but you could also charge via the Thunderbolt 3 / USB-C port. While having a dedicated charging port means the Thunderbolt 3 / USB-C is available for other uses, we hope the next version will offer two Thunderbolt 3 ports and a USB-C charger in the box. Weight: The non-touch version we tested weighs in at a barely-there 2 pounds, 12 ounces. Dimensions: The size of the XPS 13 remains the same at 11.98 x 7.88 x 0.33 inches. 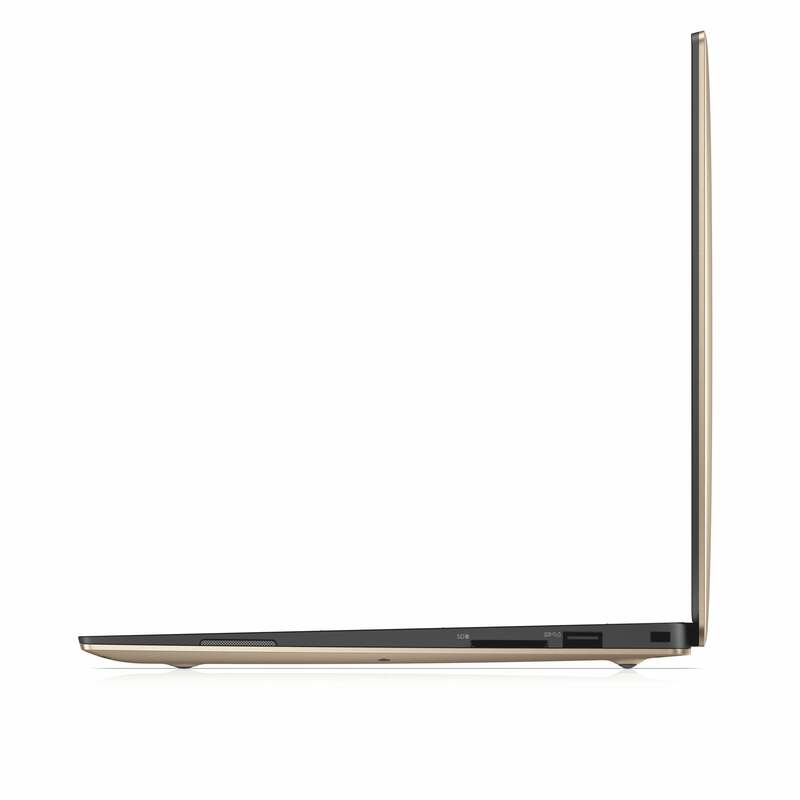 It has a much smaller footprint than a MacBook Air 13, but it's thicker than HP's Spectre X360 13T. Think of it as "stout." In practical terms, this XPS 13 hasn't changed much from the prior (2016) version using 6th-gen CPUs. That's actually been one of the complaints about the XPS 13: It hasn't had a major redesign since this generation made its debut in 2015. You know what? We're OK with it. Why should Dell mess with success? Apple, for example, hasn't really made major exterior changes to its popular MacBook Air 13 since, 2011 or maybe 2010. We, frankly, can't tell. The XPS 13 still wins on size and portability. We still love the trackpad. We think the keyboard is a little small (but still good), and we still think the webcam is really awkwardly placed along the bottom of the display bezel. The real change here is inside, and it's all about performance. When Intel announcedd he 8th-gen Core CPU, it it had successfully squeezed quad-core performance into places it couldn't before, we were highly skeptical of how much actual practical performance you could wring out of a tiny laptop, when all quad-core laptops before it weighed usually twice as much. We tested the 8th-gen XPS 13 against two predecessors: a 7th-gen Core i7 XPS 13 and a 5th-gen Core i7 XPS 13. We also roped in two much larger XPS 15 laptops with quad-core chips—6th-gen Skylake and 7th-gen Kaby Lake chips, specifically. The results thoroughly surprised us. For example, using Maxon's Cinebench R15, we can gauge the relative performance of the 8th-gen Core i7 XPS 13 vs. a 7th-gen Core i7 XPS 13. As you can see, the XPS 13 (green bar below) destroys its dual-core 7th-gen predecessor (red bar below) and runs up very close to the XPS 15s (turquoise and lavender bars below) on multi-threaded workloads. Impressive. 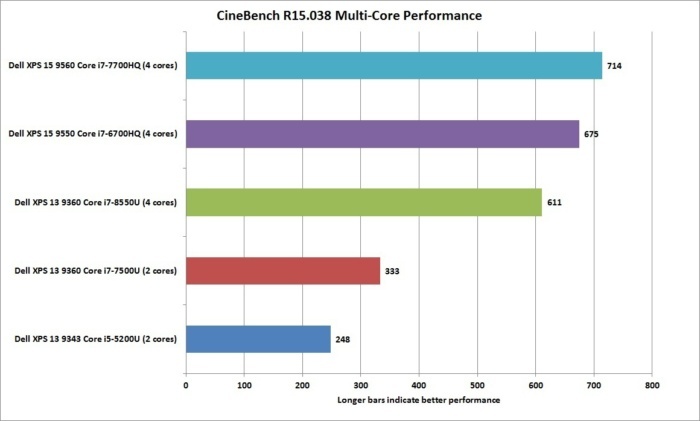 Cinebench is nearly pure CPU test and the XPS 13 kills it. Cinebench also allows you to run a single-thread test, which means the laptop's running on a single core. Running the five laptops through the same test, the 8th-gen XPS 13 (turquoise bar below) actually outperforms the 7th-gen XPS 15 (lavender bar below). No, that's not a typo: The tiny XPS 13 can outshine the beefier XPS 15 in some single-threaded tasks. Mind you, the performance is all relatively close. Because the vast majority of programs people run typically use only a single CPU core, however, this speaks well of the new XPS 13's capabilities. 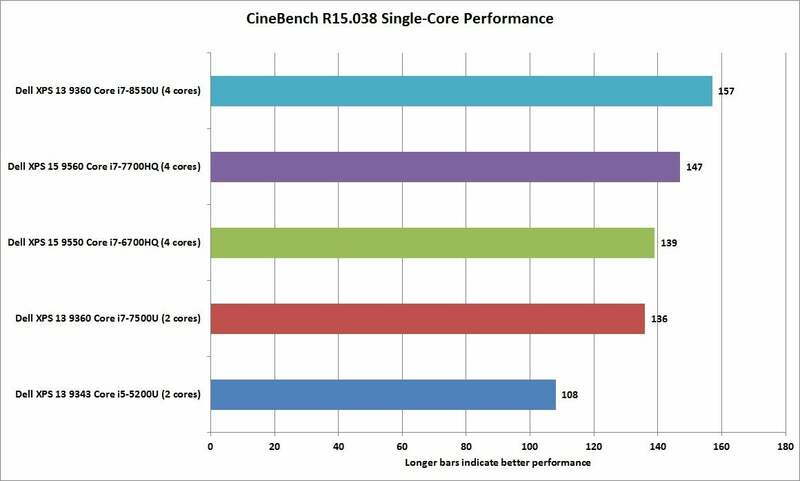 This Cinebench R15 results is an indicator of how well the XPS 13 will perform in single-threaded tasks which is what most people use day-to-day. One question we wanted to know was how well the XPS 13 and its 15-watt quad-core CPU would hold up on longer, harsher loads when compared to a larger XPS 15 and its 45-watt quad-core CPU. 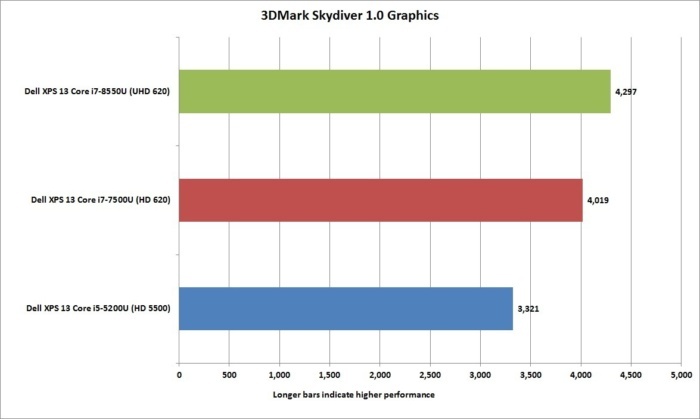 We suspected performance would drop off a cliff once you subjected the CPU to a really heavy load. The intensive HandBrake test can take 90 minutes or more on many dual-core laptops. The XPS 15 with its 7th-gen Kaby Lake quad-cores (turquoise bar below) comes out in front by a very healthy margin, as does the XPS 15 with its 6th-gen Skylake quad-core (lavender bar below). But that tiny XPS 13 (green bar below) turns in a very respectable score. Again, we're talking about a laptop that's almost half the weight of its bigger cousins. 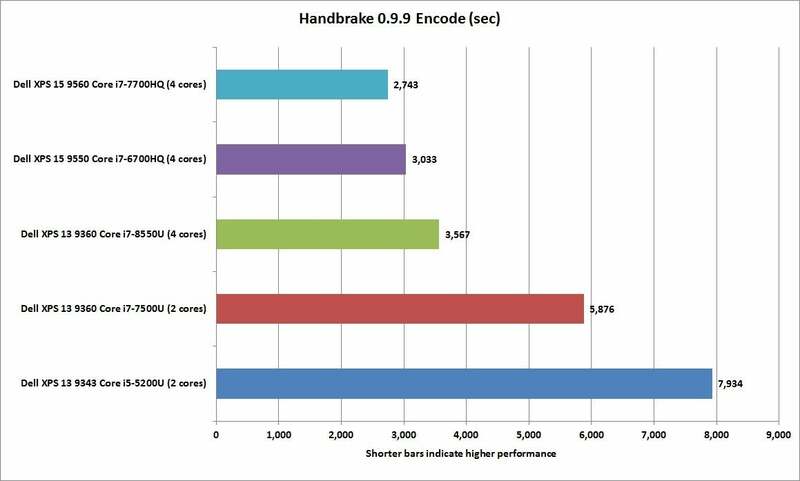 Our Handbrake test can take some dual-core laptops two hours to complete. Moving on to graphics, we compared the three generations of XPS 13 we had on hand (using the latest drivers) on 3DMark's Skydiver graphics test. We didn't include the XPS 15, in this comparison, because clearly the larger laptop's discrete graphics chip would destroy the XPS 13. 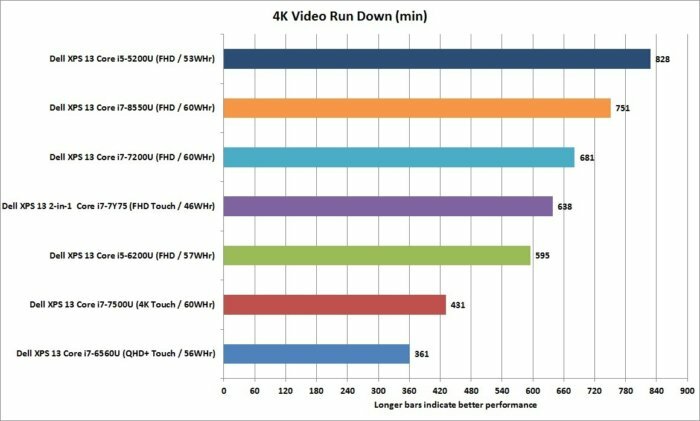 Looking at the results of the 7th-gen and the 8th-gen XPS 13 laptops, the 8th-gen is in front by a tiny margin—after all, they both have the same Intel UHD 620 integrated graphics. Both are basically fine for low-ambition or entry-level gaming tasks, but nothing to text home about. If you want more of a gaming experience, look for a laptop with discrete graphics. The UHD 620 in the 8th gen CPU is basically the same as the HD 620 in the 7th gen CPUs. To gauge performance in everyday tasks, we use PCMark 8 Work Conventional. The 8th-gen XPS 13 (blue bar below) ties with the 7th-Gen XPS 15 (red bar below), but all contenders—even the dual-core, 5th-gen XPS 13—stick pretty close. The lesson here: If all you do is browse the Internet and run Microsoft Office you don't need a quad-core CPU, so don't put out money for a feature you won't use. PCMark 8 Work tells us that you really don't need to pay for a Core i7 quad-core unless you really need it and most offices tasks don't need it. Our last test is probably the most critical for a portable laptop: battery life. For that we loop a 4K video using Windows' built-in Movies & TV player, with the laptop in Airplane mode and with earbuds in place (and audio cranked to about 50 percent). We set the screen to a relatively bright 250 to 260 nits and let the laptop run from a full charge until it dies. We compared the 8th-gen, quad-core XPS 13 to an even broader swath of its forbears. We were very curious to see whether the quad-core CPU would take down the battery. The answer is no. First, video playback today, using a modern, efficient media player, resides almost entirely in the domain of the graphics chip. But the winner is...the original XPS 13 with a 5th-gen Core i5-5200U, which pounds out almost 14 hours of playback—and this despite having a smaller battery. We think it helps that it has a low-power SATA SSD and also its 4GB of RAM vs the 8GB of RAM (more RAM uses more power). Coming in second with a very decent 12-plus hours of battery run time is the the 8th-Gen XPS 13. That's good performance. The worst performance comes from Dell's high-resolution XPS 13 models with touchscreens. Feeding all of those pixels takes power, so be ready to pay for it in battery life. Basically, expect very good battery life on the XPS 13 for video playback, though it will certainly drop on more intensive tasks. Read our deep dive on another laptop's battery performance to get more information on how battery life can vary. The 8th-generation XPS 13 comes in second in our video playback test, logging more than 12 hours of battery life. Price: Of course, the most important "spec" is probably the price. 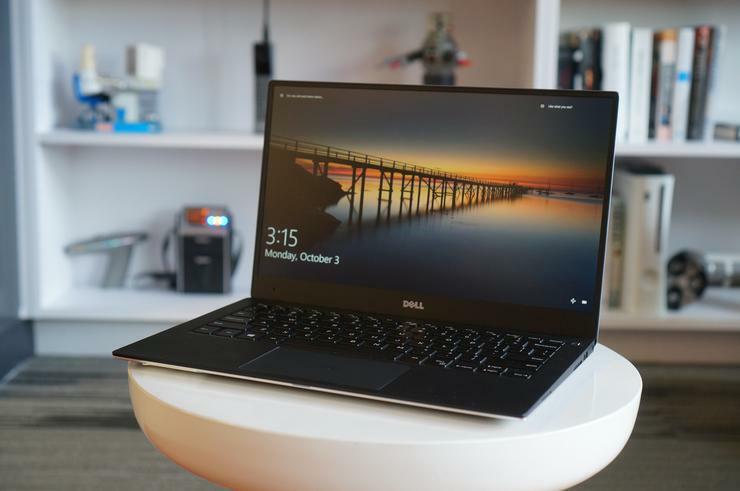 As reviewed, the XPS 13 with the 8th gen CPU, 8GB of RAM, 256GB SSD and touch screen came in at $1,299 (although we swore it was originally $1,199 when we looked initially.) With the Black Friday season upon us though, Dell had cut the price of it to $999. That's a hell of a deal, frankly for the performance you're getting. Dell offers one step up in the form of the XPS 13 with a quad HD or 3200x1800 resolution touch screen. Internally, it's the same CPU but Dell ups the RAM to 16GB of LPDDR3/1866 and larger SSD options up to 1TB. The base touch screen QHD version with a 256GB SSD pushes the price up to $1,749, with Black Friday prices lowering it to $1,549. That isn't quite the steal the FHD version is and you'll likely take a battery life hit. In the end, color us impressed. We fully expected the XPS 13 with its quad-core CPU to offer only marginal improvements at best, but the performance results were truly amazing. For those who do CPU-intensive tasks, the XPS 13 can truly hang with laptops that weigh almost twice as much. It's close enough that some might even consider skipping big laptops for the XPS 13. Not all, of course. Those who need more RAM or far more graphics grunt still have nowhere else to turn—though recent innovations like Nvidia's Max-Q and the upcoming Intel/AMD Radeon partnership could change that. But let's not diminish the fact that you can now get quad-core performance in a 2.5-pound laptop. As we said, this Dell XPS 13 is truly the best one yet.